With the multifold increase in processor performance as well as number of processor cores in a system, software systems are expected to scale horizontally with system hardware. However, software systems have the tough job of working with disparate systems that work at their own speeds (e.g. Network latency, Disk latencies, peripheral device latency and so on). So if we are building a system that does things synchronously, our throughput is always going to be limited by the slowest system in the chain. Thus, the ability of our software to initiate a task and do something else till that task completes, goes a long way to ensure we don’t ‘bottleneck’ or ‘wait doing nothing’ on a slowly running component. Rowan Miller had an excellent analogy of Async tasks to waiters at a restaurant, in his TechEd NA (2013) talk. To paraphrase – A system working asynchronously is like a waiter at a restaurant. More often than not, a waiter serving a table will be at Table 1, take an order, explain a menu item, deliver an order and then move away, free to do the same at Table 2. When Table 1 is done (deciding the order, requiring a refill, requesting the check) they will draw the waiter’s attention and the waiter would come back to Table 1 as soon as they become available (or immediately if they are available). This mechanism of one waiter serving multiple tables ensures that you don’t need as many waiters as the number of tables, to maintain optimal performance (in case of restaurant – experience). If we consider a computation unit (CPU + Coprocessors + Cache + System Bus etc.) to be a waiter serving customers, then async operations is the way to make sure that they don’t waste time waiting while the customer decides what to order. Enough analogies, let’s see some real code. 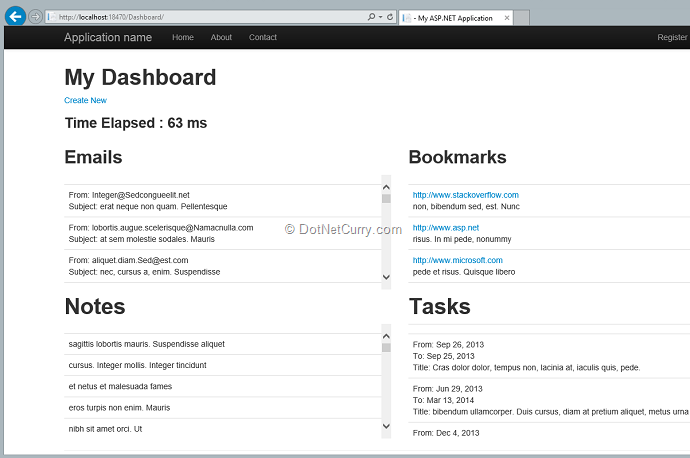 Let’s say we have an application whose home page is split into four parts showing Emails, Tasks, Bookmarks and Notes. Ideally these would probably come from different feeds from disparate systems, but to keep things simple, we’ll get them from four tables in a database. We’ve filled up the tables with some sample data that I generated. 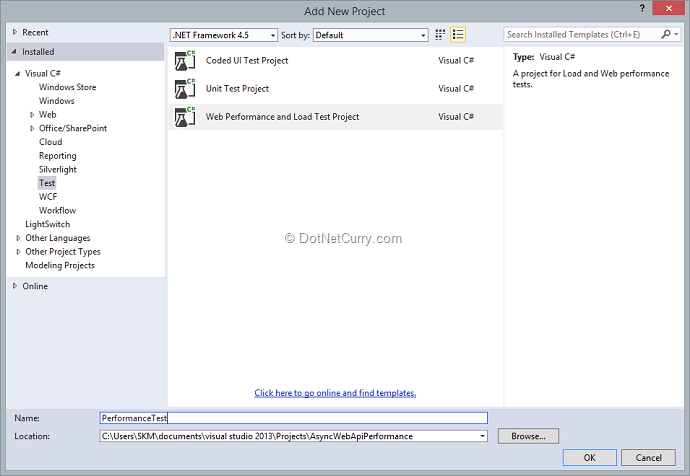 This demo uses Visual Studio 2013 Preview, but you can use VS 2012 as well. For the performance testing pieces, you’ll need the Ultimate SKU, or you can use the free WCAT tool as well. The Web API services app is using the latest Web API binaries. If you are using Visual Studio 2012, you can create a Web API application and upgrade to Web API preview version using the –pre parameter in the Package Manager Console. 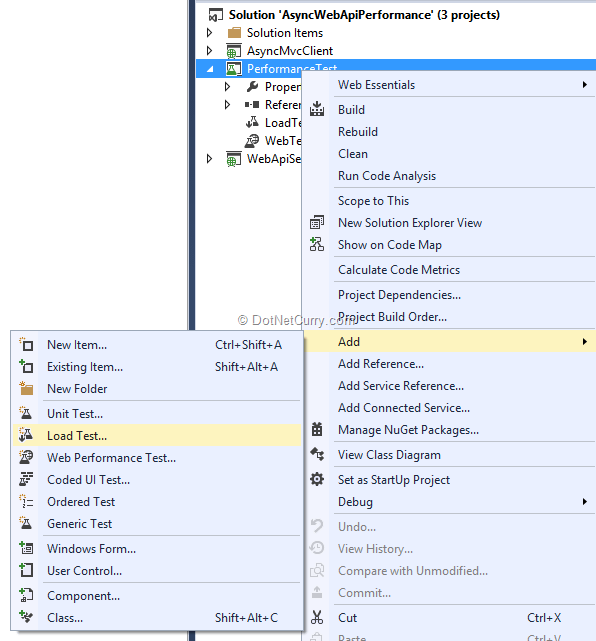 If you are using Visual Studio 2013 Preview, you are already setup with the latest preview binaries for Web API 2.0. Once the project is setup, we use the following command to install the latest version of Entity Framework (which is version 6 beta at the time of writing). Finally we scaffold Entity Framework based Web API Controllers for each of the above entities, giving us the APIs required to do CRUD operations for these entities. Instead of entering 100 rows of data manually, I used the GenerateData.com site to generate INSERT queries for the dummy data. They are included in the source code of the app. In the same solution, we can add an ASP.NET MVC Client app that will use these web services. 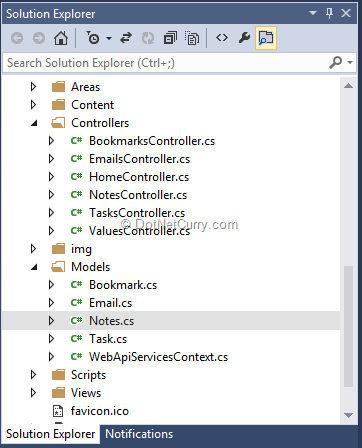 Now using Web Service in ASP.NET MVC app is trivial if you use AJAX to query service directly. But that would require CORS and other concerns like authentication etc. To keep things simple for us, we will instantiate a WebClient object and query each Web Service directly. 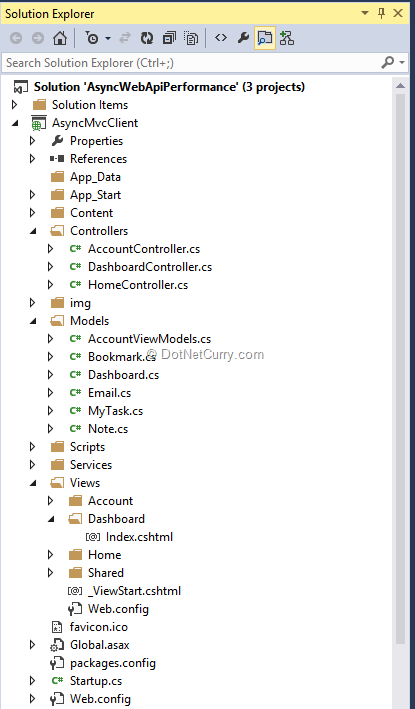 The Client app will use its own proxy entities and return one Model object that we will bind in our MVC View. Now this may not be the most elegant way to consume Web Services, but it will help us identify performance changes as we go from synchronous to asynchronous implementation. The DashboardController collates all the data from the WebAPI in the Index GET action method and returns an instance of a Dashboard Model to the Index view. The Index.cshtml for the Dashboard is marked up such that it splits the screen into 4 parts each showing the Email, Bookmarks, Notes and Tasks. We also have a stopwatch that keeps track of how much time it takes to fetch the data on the page. To positively quantify the change in performance characteristics, a simple timer like we have above is often misleading because going async almost never gives you an improved page load time on the client. However what it does give you is better page response on higher load. 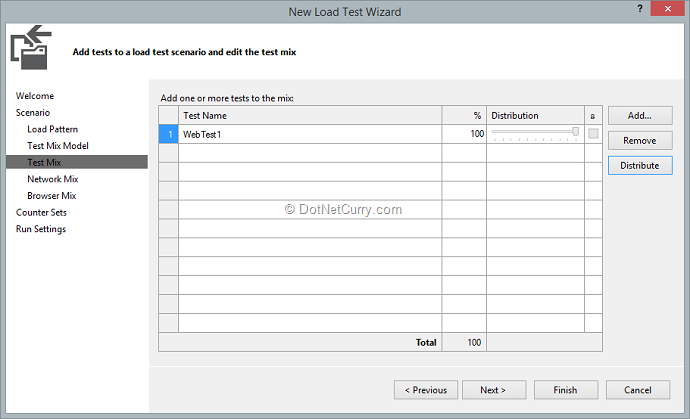 The only way to load test is use a load testing tool. Today we’ll use a Performance Test project in Visual Studio and setup a load of concurrent users. The key characteristics to watch out for are the Average Page Time and the Count of page hits while the test was running. Lets setup the project first. 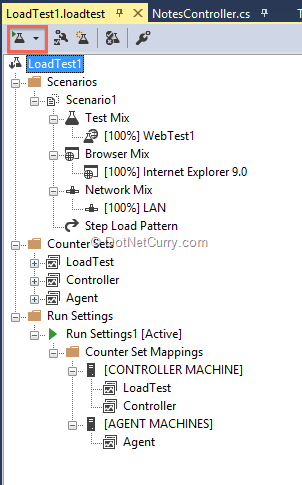 Step 1: Add a new Project and select the Test project template “Web Performance and Load Test Project”. 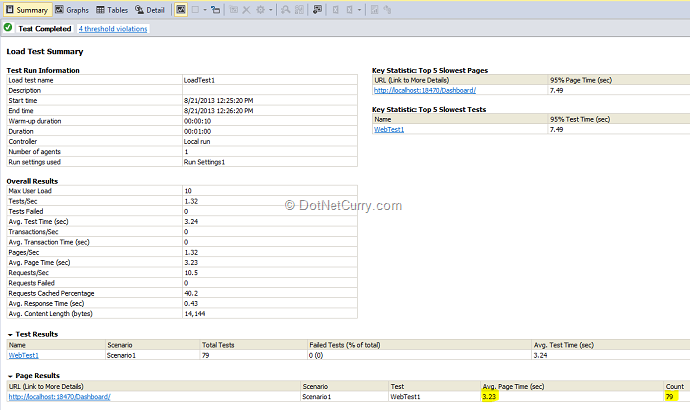 This will add a WebTest to the project automatically. 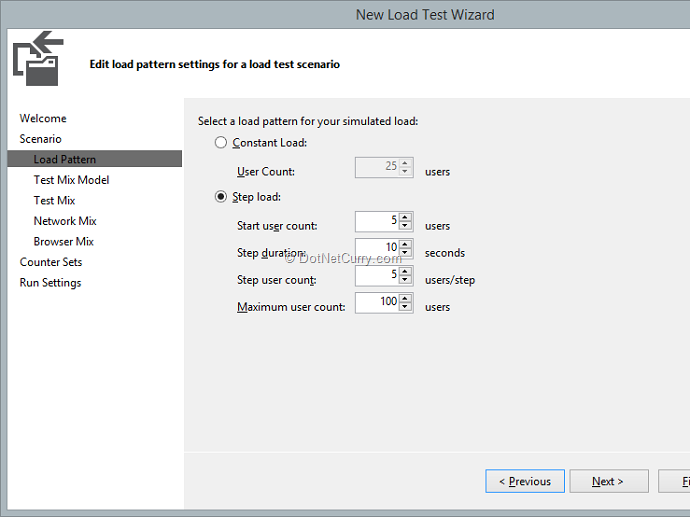 Step 2: Add a new Load Test to the project. 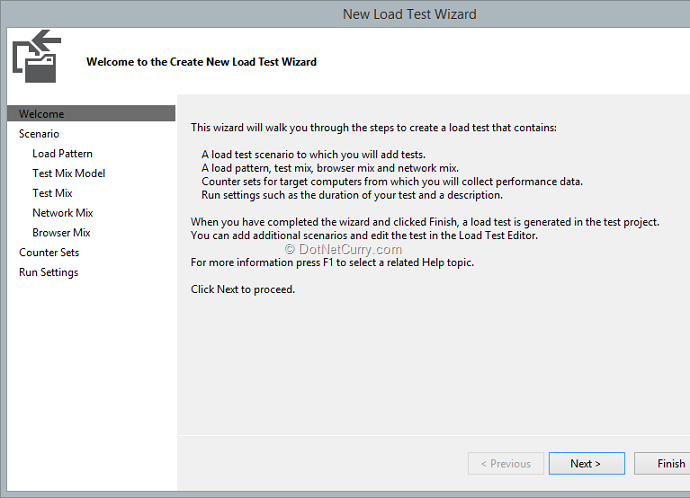 This will launch a new Load Test wizard. The “Next” page sets up the Load pattern. You can use the following settings but I had to tune it down to 10 maximum users, Start User count of 1 and Step User Count of 1. This completely depends on how far you can push your host system based on its hardware configuration. I hit the CPU and Memory thresholds pretty quickly as you will see in a bit. Once the load is setup, next step is to setup the Test Mix Model. Here we’ve to add the WebTest1.webtest to the mix. Click Finish to finish setting up the Load Test. 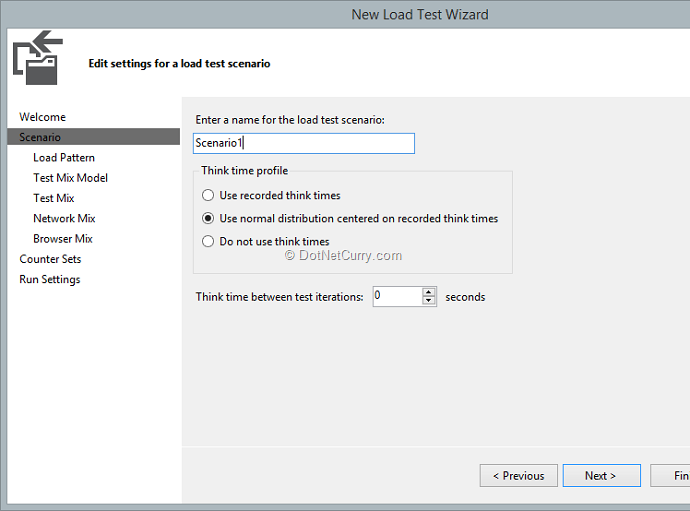 Step 3: Double click on the LoadTest1.loadtest file to open the Test configuration. Step 4: Hit Ctrl+F5 to run the application without the Debugger (running tests with Debugger gives far worse results so start without Debugger). Once IIS Express starts, start TaskManager and wait for the CPU spike to settle down. The important figures as I mentioned earlier are highlighted above. As we can see, Average Page Time is 3.23 seconds and we were able to serve up 79 pages in the 1 minute that the test ran (with progressively increasing loads from 1 user to 10 users). This gives us a baseline. Now lets’ convert our entire call stack to Asynchronous code and run the load test again to see what kind of performance we gain. We will convert our Web API Services and EF DB calls to async first. EF6 has provided Async counterparts to all calls that return Data (not the Query). The updated Api Controllers are as follows. As we can see, we are awaiting the ToListAsync calls and we have annotated our Controller methods as async and returning a Task of the Enumerable instead of the Enumerable itself. This converts the service calls into async but what about the client? It is still calling the service synchronously. We switch to our AsyncMvcClient project and get to the DashboardController. We first update the GetFeeds method to use the HttpClient() object instead of the WebClient object. The HttpClient has only asynchronous APIs, so we call the GetStringAsync API. The keen eyed would note we are not awaiting the calls, so we are getting a Task from the GetStringAsync method. Next we have a await for Task.WhenAll(…) and pass all the Task instances to it. What this does is, it retrieves all the Tasks and kicks them off together and waits for all of them to return. Once they all return, we create the Dashboard object and return it to the Action Method. We update the Index action method to be called async as well and it now returns a Task instead of ActionResult. With that, we’ve converted our application to Async all throughout. Moment of truth, Time to test the outcome. Do a Clean Build and hit Ctrl + F5 to run the application without debugger. 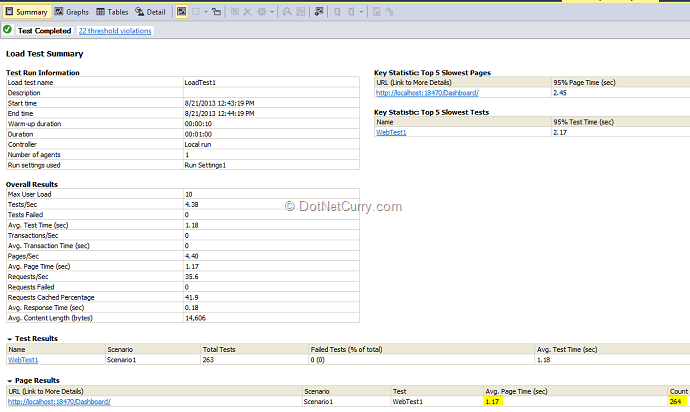 Open the LoadTest1.loadtest file and Run the Load Test. As we can see, the Average Page Time is 1.17 and the Page Count is 254 - almost threefold increase if the number of pages hit and the 1/3 the Average Page time. This validates our belief, but there is more than meets the eye here. The improved scaling of the app resulting in the higher Count of requests handled is understandable, but how did the page time drop? Well, remember the bunching up of Tasks and then firing them off with the Tasks.WhenAll? Yup, that’s where I cheated by launching Async tasks in parallel (more threads so BEWARE). If I awaited each request to the web service, I would still get improved performance, but the Average Page Time would be similar to Synchronous operation as the following image shows (Page time of 2.92 and Request Count of 108). So yes, Async and Parallel Async are different and affects scaling and performance differently. Performance testing is tough, performance testing on a restricted VM is even tougher. To be honest, I couldn’t find enough performance difference for the Four Database calls (there is a caveat regarding database calls and async but that’s coming in a minute), hence to get some visible difference, I put a Thread.Sleep(500) for the synchronous calls and Task.Wait(500) for the asynchronous calls. Hence you see the 2 second+ Page times. Apart from making the performance difference obvious, I believe it doesn’t affect the conclusions. - Asynchronous calls with await for each service calls still takes 2+ seconds but handles 100+ Page requests. - Asynchronous calls fired off in parallel take < 2 seconds (1.17 seconds) because there are 2 cores in action so effectively the 4 requests were handled by two parallel threads reducing the page load time and handling more Page Requests. Okay, so async and multi-threading usually gets all hairy and controversial if the caveats are not called out. I already called out one where the Task.WhenAll was potentially spinning up more than one physical thread to service one request. This can get dangerous and lead to Threadpool starvation in case of very high load. Next, by making your Service calls async, you are moving the performance bottleneck from the Web Tier to the DB Tier (in our specific example). This could come back to bite you with increased DB server load. So use async on DB server cautiously. However, if your services are going out to the Internet to fetch data (like from RSS feeds) you are good, because in that case, you will be firing more requests to an external service (which may be subject to its own rate limits) and won’t be killing any of your internal systems. In a nutshell, if the process is really long running and not stressing out some other part of your architecture, async is a good candidate to improving scaling of your web tier. - Difference between scaling and performance gains when using Async. And would function exactly as before but without the additional compiler re-writing it to a state machine. Good point Tony. However at the time of writing, my intention was to merely highlight how EF6 provides Async counterparts to all calls that return Data. Yes I could have made the example more concrete by making use of that result. Nevertheless you made an important point and thanks for the same! Loved this article. Great work..!! 1) Task.WhenAll does not spin up multiple threads. 2) "Thread.Sleep(500)" is not at all the same as "Task.Wait(500)"; you should compare "Thread.Sleep(500)" with "await Task.Delay(500)" for a more realistic load testing scenario. Great article! 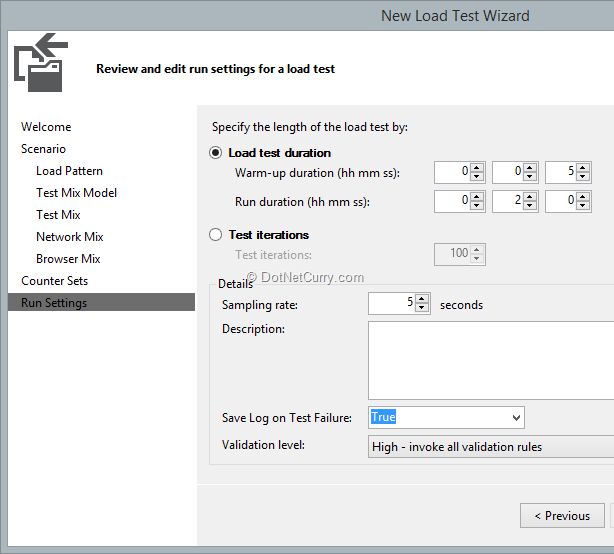 Is there web performance and load test project for VS 2012? Can you please fix your print style sheet so that I don't have to waste money on ink for all of the right hand side advertisements? I would think that your print media would be the body of the article, not all that extra stuff. Stefanveliki: I hear you loud and clear. Please bear with the design till March end as we are coming up with a major overhaul for the entire site. Printing will be fixed in that release.